This is beautiful! The detail on the bee is really great and the lighting is perfect. The textures are also really nice and add a lot to the scene. You captured the scene very well. very very cute, but what is the bee’s eye reflecting? 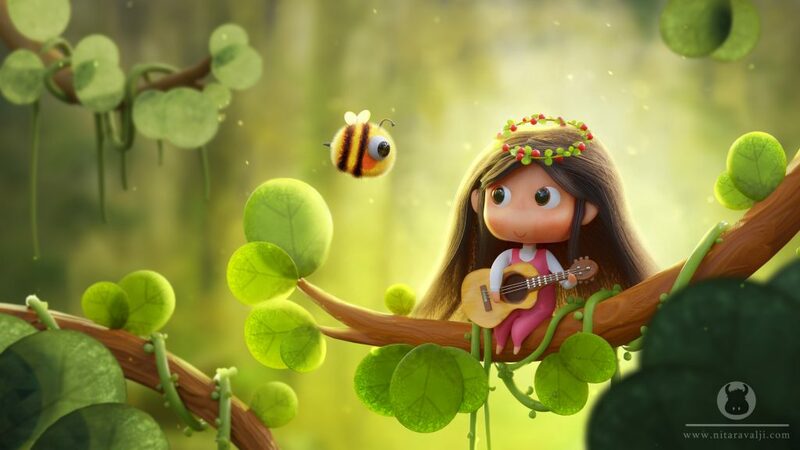 haha that little bee is so nice!!! Its really a great execution i think of a 2d concept/illustration. How did the original artist thought about it? well the original plan was that only hehehe… Thank you . This is a lovely image, charming characters and lots of stylistically appropriate detail. It can often be difficult to get the balance between details and the overall composition but you certainly show how to do that here. Thank you for creating my new wallpaper! very good, adorable character too.